The word “hajj” means pilgrimage or holy visit but according to the shariat, it means the great annual pilgrimage in Makkah shareef which every muslim having the means must accomplish at least one time during his lifetime. It is the fifth pillar of Islam. The hajj is a great ibaadat which comprises many points and details, but we put here only a short summary of the principal moments of the pilgrims. Generally speaking, such a voyage is a great moment of one’s life which must be prepared carefully. One prepare it morally and spiritually with an expert (`Aalim) or specialized group, documents etc…till the great day of departure. During all the hajj, the haajees are plunged in ibaadates (prayers) and recitations. The pilgrims of the world converge towards holy Mecca (Makkah shareef) to achieve Umrah (the little pilgrimage), while waiting for the 7th day of the month of pilgrimage (Zil-Hijjah) to begin the program of hajj. They penetrate the sacred perimeter in a state of Ihraam, white pieces of cloth unsewn, like a uniform in the form of the poor, cause in the enclosure of the sacred house of Allah, one is presented in the form of the needy (faqeer). All muslims coming from any part of the globe wear the same dress in the surrounding of the ka’bah. They begin the activities of the hajj around holy the ka’bah by making its circombulation (tawaaf) in 7 rounds. They make a blessed stopover near the “Maqaam-e-Ibraheem” station of Hazrat Ibraheem (a.s) by making a special namaz. They drink the blessed water of zamzam (pure and miraculous water source at the foot of holy the ka’bah). They make the “Sa’i”, 7 courses of running on foot between the hills of Swafa and Marwah. Then they shave the head or cut hair only symbolically for instence (the ladies only cut the end of the hair length of an inch). The 8th day of Zil-Hijjah, they start a great circuit by moving to Mina, in the suburbs of Makkah, for staying up and special ibaadats. Then move towards the plain of Arafaat on the 9th day which constitute the pillar of the hajj for special ibaadats there. Then they make the way to Muzdalifa for other special ibaadats. From Muzdalifa, they return towards Mina before stepping back to the ka’bah in Maccah to shave definitely their head and to again carry out a tawaaf called Tawaaf-e-ziyaarah. The hajj, by definition, will be finished there at this time. But, the haajees will go again to Mina to spend 3 more days for other ibaadats and lapidation of 3 jamraats (steles symbolizing the damned Satan). Perhaps the lucky ones will have the occasion to visit the various places, mosques, qabarastaans (cemeteries) in the neighbourhoods of Maccah shareef. 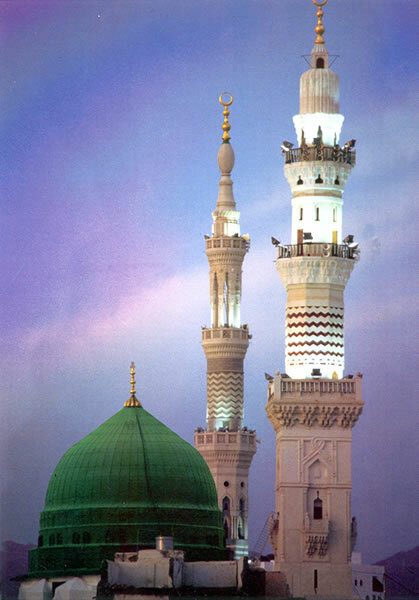 Then the pilgrims will go pay visit to the last and Chief of all the prophets, Hazrat Muhammad Mustapha in Madeenah-munawwarah (the holy town of Madeenah) and will spend generally at least 8 days there. To do namaz, ibaadats or to spend some moments in the fragment of paradise, characterized by space between the grave of the holy prophet ( peace be upon him ) whch was formerly his house, in the mosque of the Prophet , will be a great moment in the life of believer. The lucky ones will hopefully be able to visit the various places, mosques, qabarastaans (cemeteries) in the neighbourhoods of Madeenah shareef. The moment of the departure is in general a heartbreak moment for the believer, because it is certainly not easy to leave the town of our beloved and dear Prophet . The hajj is a great ibaadat which requires many control, knowledge and preparation, please consult the books covering the subject and the `Aalims who will give you all advises you need on this great ibaadat.